Stanford University Press, 9780804754613, 240pp. Condemnations of "victim politics" are a familiar feature of American public life. Politicians and journalists across the ideological spectrum eagerly denounce "victimism." Accusations of "playing the victim" have become a convenient way to ridicule or condemn. President George W. Bush even blamed an Islamic "culture of victimization" for 9/11. The Cult of True Victimhood shows how the panic about domestic and foreign victims has transformed American politics, warping the language we use to talk about suffering and collective responsibility. With forceful and lively prose, Alyson Cole investigates the ideological underpinnings, cultural manifestations, and political consequences of anti-victimism in an array of contexts, including race relations, the feminist movement, conservative punditry, and the U.S. legal system. Being a victim, she contends, is no longer a matter of injuries or injustices endured, but a stigmatizing judgment of individual character. Those who claim victim status are cast as shamefully passive or cynically manipulative. Even the brutalized Central Park jogger came forth to insist that she is not a victim, but a survivor. 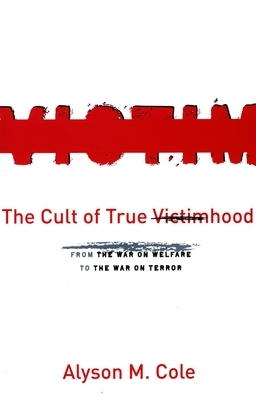 Offering a fresh perspective on major themes in American politics, Cole demonstrates how this new use of "victim" to derogate underlies seemingly disparate social and political debates from the welfare state, criminal justice, and abortion to the war on terror.